These 7 principles apply to most successful songs, regardless of genre. Download “The Essential Secrets of Songwriting” 6 eBook Bundle, and get “From Amateur to Ace: Writing Songs Like a Pro” free. Read more..
All successful songs, whether you’re talking about ones written 100 years ago or today, take listeners on musical journeys that are remarkably similar. In fact, research shows that the main difference between old songs and new ones is a difference in performance style, not compositional substance. The easy proof of that is seeing how incredibly easy it is to take an old tune, like Bach’s “Minuet in G“, and change it into something that would sit near the top of the Billboard Hot 100 in the 60s: “A Lover’s Concerto“. Because of that, it’s possible to make generalizations across practically any and all styles, and discover that the things that improve a song in one genre are the same kinds of things that would improve a song in another. Good music needs contrast. Contrast simply means the careful and clever placement of opposites in music. For example, songs often benefit from loud sections contrasted with softer ones. But loudness is only one possibility, and in some genres may not be an important one. There are others, though: high-pitched melodies contrasted with lower-pitched ones, faster versus slower rhythms, and strong versus fragile chord progressions. All songs need something that displays contrast. Energy needs to build. A good song contours the energy such that the end of a song is every bit as energetic as the beginning, and often more so. Sometimes, energy will translate as basic loudness: the ends of songs are often louder than the beginnings. But there are other ways to build energy, even including how a story unfolds in the lyric, and how instruments are added through the course of the song. Chords need to become stronger and more predictable in a chorus. A “strong” progression means that the key of the song becomes very obvious. So while Dm Em Bb F may be slightly vague, tonally, it works brilliantly in a verse. A progression like C F Dm G C is stronger, more predictable, and works very well in a chorus. Stick to these kinds of progressions in a chorus, and your music becomes more easily remembered. Chords need to change at regular intervals. You’ll notice that the best music chooses a pattern of frequency (called the harmonic rhythm) for chord changes. For example, many songs will hold on to a chord for 4 beats or 8 beats, before changing to the next one. There is no rule to say which is better- it depends on many factors. But most songs will choose one to predominate. You can change throughout your song, but audiences enjoy music when there is a predictability of when chords will change. 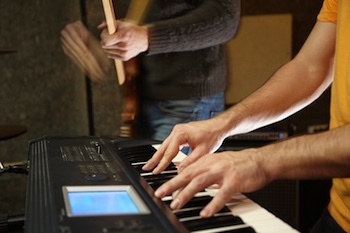 Melody, chords and lyrics all work together as an important partnership. No one element of a song exists in a vacuum. If you want your lyric to have more emotional punch, for instance, you’ll want to think about where in the melody you place important, emotional words. Words high in pitch are often heard as more emotional and have more impact. Similarly, words will sound stronger and be more easily remembered if they are accompanied by tonally strong chords. This 3-part alliance of melody, chords and lyrics is really what songwriting is all about. Allow your lyrics to progress naturally from observational to emotional. Verse lyrics need to relate a story, while chorus lyrics need to describe the emotional impact of that story. Getting this wrong accounts for many songs that seem weak or ineffective. Give the listener something to easily remember. Not every song needs an obvious hook, and there are many examples of hit songs that don’t have a repetitive hook that stands out (“Penny Lane”, for example). But in any case, the audience needs to remember something about your song. When you’re done, you should be able to listen to your own song, and find the moment or two that’s always going to be memorable and catchy. The Essential Secrets of Songwriting 6-eBook Bundle now contains a 7th eBook – and right now, that eBook is FREE. “From Amateur to Ace – Writing Songs Like a Pro” shows you the most common errors songwriters make, and how to quickly solve them. These 7 eBooks are all available at a bundle price of $37 (reg. $95.70). Click here to learn more. Posted in songwriting and tagged compose, guide, how to write songs, music, principles, songs, songwriter, songwriting.